On November 4th Missourians will be making the decision to vote yes or no on Amendment 3. 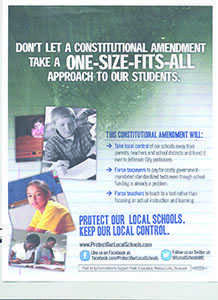 If passed it will take local control away from parents, teachers, and school districts and hand it over to the politicians. Force taxpayers to pay even more money for government-mandated testing (estimated a billion dollars in additional cost yearly), force educators to teach to the test rather than focusing on actual instructions and learning. Our schools cannot afford to lose learning time nor can they afford more unnecessary mandates. Not only will taxpayers be affected, but educators. Their test scores will affect the teacher’s salaries. The proposal will require teachers to be dismissed. Promoted, and paid based off of a teachers-evaluation system using the students test scores as the scale. The Missouri department of education would have the authority to cut state and local funding from a district by cutting off both state and local funding if it doesn’t approve the teachers evaluations. Teachers associations would be prohibited from having an input into the evaluations system through negotiations. The amendment is changing students from people to numbers, The people who know students the best are the teachers, parents and local school boards they see the it everyday, while some Politian’s haven’t seen the inside of a classroom since they graduated. Teachers want to teach us, not test us. They want to see how great we can be, not how well they can preform.